On the left was my college graduation pix from Mount Holyoke. I refused to step on the scale but I was probably around 190lbs. Me on the right today in my bikini around 134. Thank you! That is really all I want to say. Thank you for all the support, kind words, and messages you have sent me over the past week and a half since I rocked a bikini for the first time in my life. Nearly two weeks ago I stood in the middle of Dupont circle conquering a long time fear and it felt AMAZING! COURAGE WILL OPEN NEW DOORS: The biggest takeaway that I wanted to share with you after doing my #bikinichallenge1073 is that courage will open new doors. When you have the courage to stand up and admit something, try something new, or put yourself out there it will attract that positive excitement right back at you. It’s almost like once you make a decision and take action everyone works with you. New passions, friends, and stories come from courage. I WASN’T AS CRAZY NERVOUS AS I THOUGHT I WOULD BE: I really wasn’t nervous the moment I rolled up to Dupont circle and flung my cover up on the ground to expose my bikini. Sure some people looked at me like I was crazy and walked in the other direction but nothing could kill the vibe. I had waited and worked hard to own this moment of accepting and loving myself. 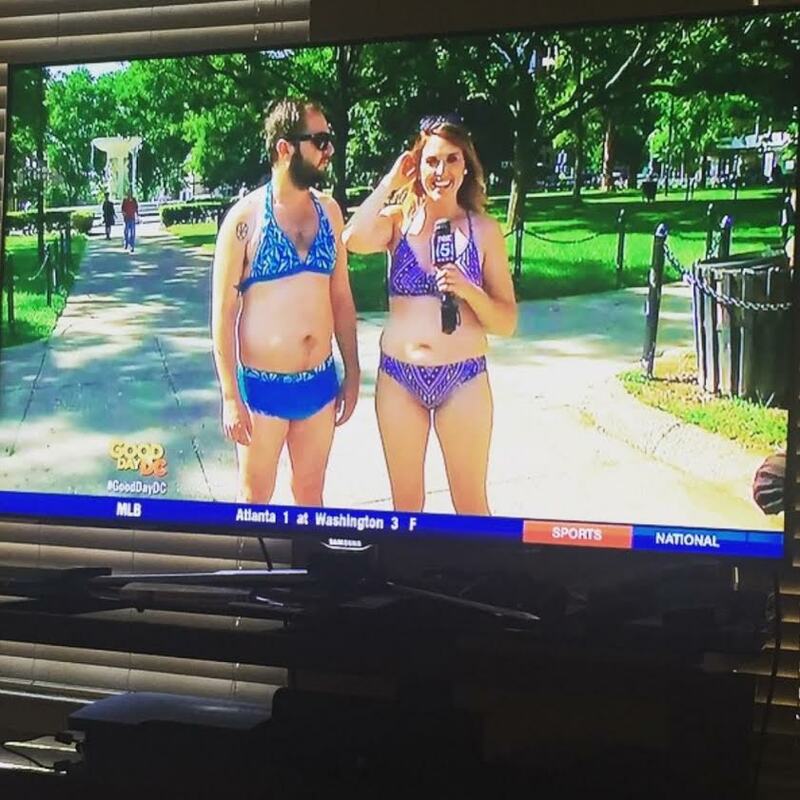 Even when Fox 5 told me they wanted to put me in my bikini on TV I still had a sense of calm. I felt like it took me 17yrs to love my body so why not put it on TV!? AGAIN…I WANT TO DO IT AGAIN! Since last week…so many of you shared your awesome stories of overcoming and continuing to work thru your body image issues with me. Thank you for being so open and honest. So I want to have another bikini rally at the end of the summer on the National Mall. Maybe on a Saturday!? Come in your bikini or speedo or board shorts or I’ll find an awesome business to give us some swim wear and we’ll do it together…what do you think? Lets make the #bodyrally a movement. MEN STRUGGLE TOO: I want to thank all the awesome fellas who joined me in Dupont or sent me kind messages of encouragement. I never realized how many men struggle with body image too and the fellas seem to get ignored. I really heard the men that they feel a lot of pressure to look a certain way and it’s hard. This challenge made me realize that as many men struggle to love themselves and their bodies as women do. Fellas…you are being heard! Lastly…several people have messaged me or asked me where to start if you’re struggling to love your body, embrace you for you, and stop the insane diet mentality. Here are a couple books that helped me get to this place…Women, Food, and God! (This book is sooo good. Fellas you’ll like it trust me, and it’s not about religion so if that’s not your thing no worries). Diets Don’t Work! (Great book to stop the rat race of dieting) and Intuitive Eating and Savor (Both books are about mindful eating, mindful life). Posted on July 5, 2015 in General. My relatives all the time say that I am killing my time here at web, except I know I am getting experience every day by reading thes nice content. This is awesome! I too, have an ongoing conflict with the bikini. Every spring I swear I will lose the last 10 lbs and rock a bikini at the beach. Every year I chicken out. congratulations on beating the bikini! 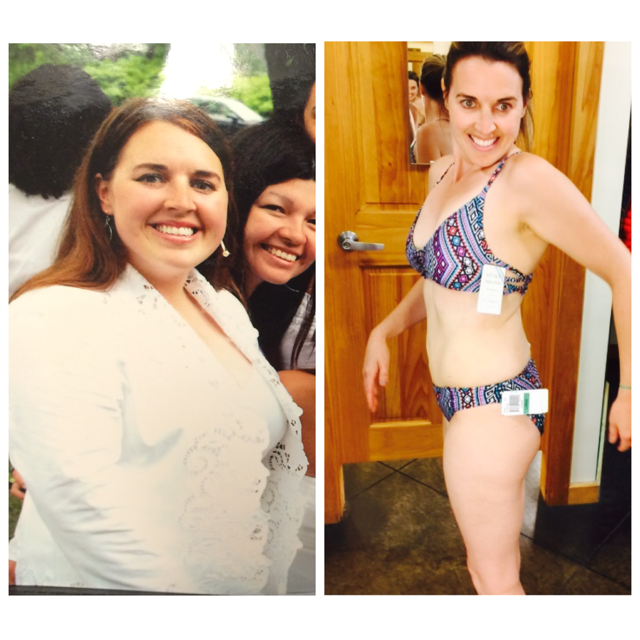 Hi Sarah – I’m starting on my food recovery today. What about doing a book club with these books for interested people? Wow Sarah what an accomplishment. You are beautiful in both pictures. Much love. I absolutely love what you’ve said about this challenge. I used to work in an eating disorder unit, and now currently help adults with binge eating disorder get the treatment they need. Body image issues affect every group of people, so I’m glad that you mentioned men in your post!!! Along with the books you’ve mentioned have you ever read "Brain Fix" by Dr Ralph Carson? Give it a read if you haven’t, and if you want any copies of it for an end of summer rally like you mentioned, let me know!